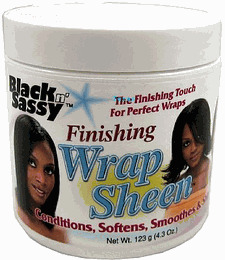 Black N Sassy Finishing Wrap Sheen-4.3oz jar Black n' Sassy Wrap Sheen shines, conditions, softens & smoothes FOR SHINY, STUNNING, SMOOTH, HEALTHY LOOKING HAIR! Use daily to smooth the hair, condition, soften and add shine. To reduce breakage, smooth split ends and add amzing shine instantly. The perfect finishing touch. ALSO GREAT FOR OTHER RELAXED STYLES!